Known as the Covert Autonomous Disposable Aircraft or Cicada, this new drone technology is capable of detecting and predicting tornadoes, and also locating submarines due to its uncanny ability to read weather through its sensors. The cicada unmanned aerial vehicle or UAV is designed for meteorological and military purposes, and can be deployed for commercial purposes depending on certain adjustments. The cicada drone can fit into the palm of your hand, and it is designed just like the normal cicada – a burrowing insect that issues a high-pitched sound. Cicada insects leave the ground and fly in large swarms, before dying soon after reproduction. 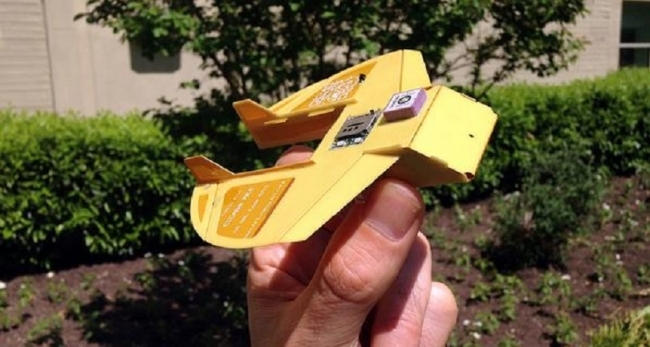 The cicada drone is made just like this; they will be sent out in large numbers for specific purposes after which they crash from the sky after completing their tasks. With 10 individual components, the airborne UAV has no motor or propulsion system, but it can fly with ease and land anywhere close to 15 feet of its target, regardless of whether it dropped from as high as 57,600 feet. Designed by the Naval Research Laboratory, the cicada drone costs $1,000 to build but there are plans in place to reduce the cost of building one to about $250 in the nearest future. It is unstoppable and can fly through a vegetation of shrubs and through trees, and it can regain its balance after hitting any hard surface. While it might soon be used for transportation in time to come, it is already being used for surveillance purposes. And with its ability to be adaptable to various uses, it can be applied to inspect facilities or to even deliver mail. The technology behind the cicada drone is something else, and it will soon be available for individual and industrial purchase. It also costs less to maintain, and it can get airborne as soon as you have it with definite instructions on what it needs to do.